Loves Labours Found by Jennifer Allee has slavery as its focus. There should only be one master – God. A little kindness goes a long way. A sweet story which both entertains and horrifies the reader. His Indentured Bride by Angela Breidenbach is set in America in the 1770’s and covers the war for Independence, fought to bring freedom from England and freedom for indentured servants. Loyalty, love and the faithfulness of God are just some of the themes. 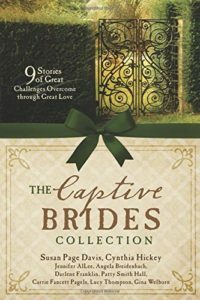 The Suspect Bride by Susan Page Davis is set in 1890. It has the themes of truth and trust. When our character is under attack, sometimes the only thing we can do is sit back and trust that God will make it all right in the end. A search to uncover the truth reveals some surprising evidence. Through Stormy Waters by Patty Smith Hall has the theme of the sins of the fathers being paid for by their children. It offers new beginnings, hope and the perfect Father in God. We feel like God has abandoned us at times but He never leaves us. A gentle tale of kindness and second chances. Moira’s Quest by Cynthia Hickey concentrates on bringing the villains down. Nineteenth century women had few rights and were exploited by men but there were good men too. A hard life means it’s all too easy to think God is absent or doesn’t care but He does. A wonderful feisty heroine and a great story. 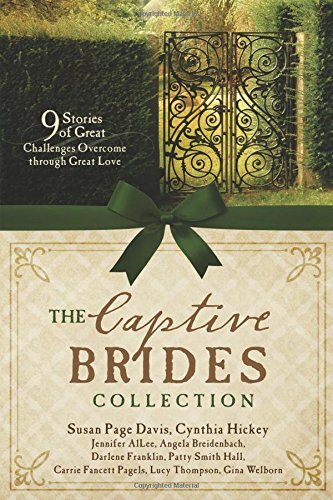 Love’s Escape by Carrie Fancett Pagels is a delightful tale focusing on the evils of slavery. The irony of a character fighting for freedom whilst enslaving others is not lost on the reader. God can be trusted at all times. Carrie Fancett Pagels highlights the need for all to be free, where it is the state of our heart that matters most and not the colour of our skin. Wonderful characters in this wonderful tale. Waltzing Matilda by Lucy Thompson is a light hearted read on the serious subject of women prisoners in Sydney in 1821. There are some wonderful exchanges of dialogue between the two lead characters that are a joy to behold. There is the theme of trust. The motif of sheep reminds the reader that we are the Lord’s flock and He will seek out the lost, the lonely and the least. A Score To Settle by Gina Welborn shows how captivity does not have to contain bars. Lying keeps us prisoner. The truth will set us free. A wonderful tale. Thanks so much, Julia, for this fantastic review!!! So glad you enjoyed Lettie and Nathan’s story! Blessings! Thank you so much! People willing to review are a true gem.